Saw the Philadelphia show, it was a moment for me. a fan for 35+ year and of hundreds of concerts it was the same as 3 shows in recent years with Dio (Sabbath/Heaven and Hell): I cried at the joy of hearing them play. And they were AWESOME while obviously having a good time. A 2 hours lesson to make “instant fad, 2 albums” bands go back to their garage and learn to play. Was a privilege to be there. Its interesting to read your comments. I haven’t seen them yet and accept the fact that Bill isn’t there – doesn’t really bother me. So many people are saying Ozzy is sounding like crap and the live shows haven’t been as good. Then I read comments like your’s (and others) who say how great it was. Makes me wonder if some people just have the blinders on and won’t accept this version of the band, or if its a simple case of ‘to each his own’. Glad to hear you enjoyed the show. Its always the best when a band you’ve loved for years don’t disappoint. Slow ticket sales = last tour rumor. So obvious. 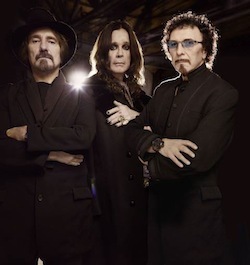 They never saw the Sabbath on their last tour with Ozzy decades ago, trust me, they are better now even without Ward. Don’t believe Geezer, the tour is making big loot….another LP & tour soon. buying. BLUE RAY leftover songs whatever….HEADLESS CROSS DELUXE EDITION who cares this is where it started. Ask me when I was born, I ll say the year VOLUME 4 came out(not STPs). My only beef with this tour is I’m a SABOTAGE guy and it got shut out. (AGAIN and HOW?.) SABOTAGE is a masterpiece with a hideous cover that’s all. The genious of that album will always be overlooked. As far as I’m concerned SABOTAGE beats ZEPPELIN 4 head to head. Nnnnnnnnnnn NnnnnnNnnnnnnnnnnnnnnnnnnnnnnn bbbbbbbb Iiii I fans we ll take. I ll pre order any blue ray or future release at all.